The upgrade to Total Uninstall 6. Compatibility with version 4.x and 5.x. Install Total Uninstall 6 in its own folder. We recommend the default install location suggested by the setup program. Total Uninstall 6 can coexist with any previous major version 5.x, 4.x. 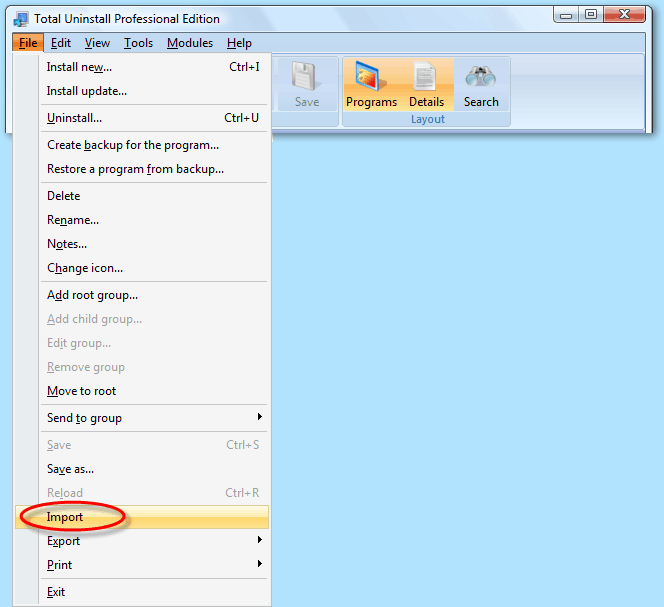 To import Total Uninstall 4.x or 5.x log files (recorded installations) into Total Uninstall 6 you have to use the Import action from the main menu. This action is available in the "Monitored Programs" module. The old version can be uninstalled completely, including its program data. Keeping old version installed and using it will not affect in any way the new major version. If the previous version store the logs in a custom location, make sure the standard location doesn't exists. The standard location must be deleted or renamed, and then the program will show a standard "Browse for folder" dialog to select the custom location.